Goth Shopaholic: A Very Scary Cthulhu Christmas! The Lord of Darkness rises this holiday season! Gaze upon these great Christmas items that have been touched by the Great Cthulhu! 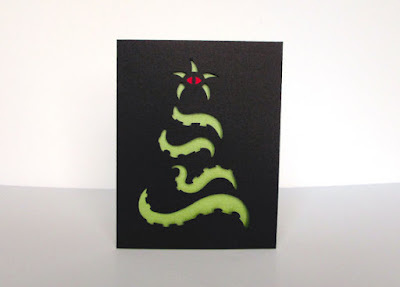 This is a lovely Cthulhu Christmas Tree Greeting Card design. This comes in a set of 10 and is a silhouette design with green and black paper. The eye of the beholder is placed on the very top of the tree looking down at all of us poor souls. Since the card is blank on the inside, it is perfect for all kinds of dark ritual writing. 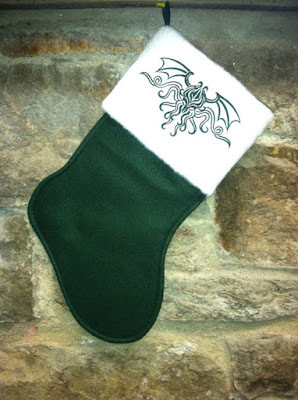 This is a super cool Cthulhu Stocking! I really wish it came in red, but it's still a awesome design! It's a felt homemade stocking with Cthulhu embroidery on the top. It measures about 17 inches from top to bottom! The following item is just a simple and cute ornament I figured I would share. 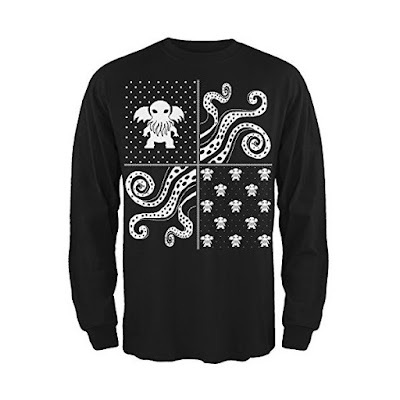 These little Cthulhu Octopus Ornament measure up to 5 centimeters or almost 2 inches for the rebellious Americans! The 6 ornaments can come with hooks or without hooks, whatever your preference is. 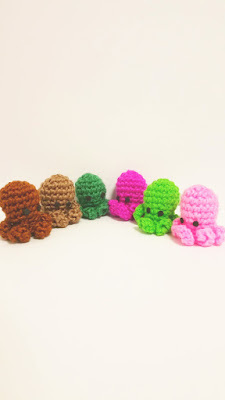 This particular Etsy seller Kutuleras seems to be well versed in Cthulhu handmade items. This delightfully malevolent ornament makes me smile with so much madness. This is an amazing piece of art. The Yuletide Cthulhu Ornament is handmade with resin material and measures 6.5″ x 4″. It shows the Great Cthulhu forcing his way through the a hieroglyphic covered door in R’lyeh. The ornament comes with a black satin ribbon. 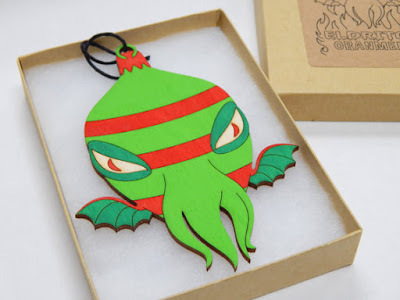 Here's another simple and cute Cthulhu ornament. ThisCthulhu Ornament pictures Cthulhu wrapping his tenticles around a present with a Santa hat on. The expression in his eyes to me show "Don't even try...". The ornament measures about 2.5" tall and comes with a metal ornament hook. This next ornament is a different style, which I find very interesting. What a cool idea! This etsy artist ObakeStyle used high-tech lasers to create this Eldritch Ornament! He paints his engravings with acrylic paint. This particular ornament is 3.6 x 4.7 inches and made out of a thick Baltic birch wood. Not only will this ornament give your tree a chaotic flare, but it's a pretty neat piece of art. I cannot resist putting these up here! These are too funny! 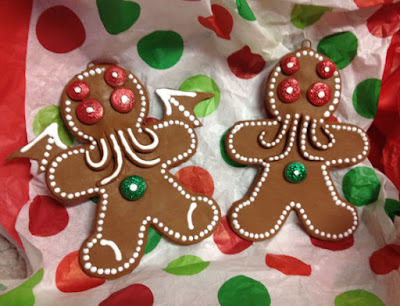 I laughed at these Cthulhu Gingerbread Ornaments so hard, I'm embarrassed! If I had any intention of hiding my darker side to my family, but really want to indulge myself and smile maniacally at my Christmas tree, this is exactly what I will get. The ornaments are about 5 inches tall, decorated with glittery buttons and made with sculpey. God... and the wings... 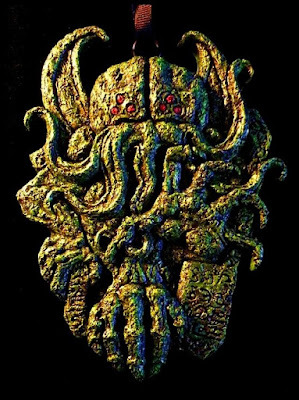 I really love this ornament, because it isn't just Cthulhu wearing a Santa hat. 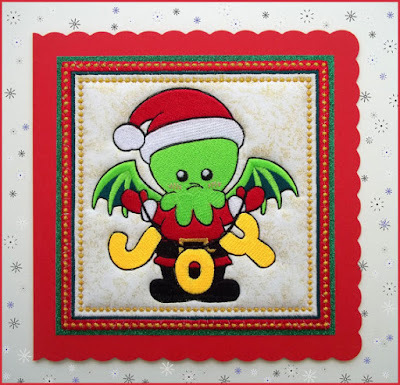 I know I just said I don't like the stereotypical Cthulhu in a Santa Hat, but I'll make an exception for this card, because this is another one I thoroughly enjoyed. It is so clear that Cthulhu in the Cthulhu Fabric Christmas Card is not a happy camper. I can't pass up an oxymoron that makes me giggle. Cthulhu, clearly unwilling (who even got him to do this? ), is holding up a string that spells out "JOY". This is a card made out of embroidery thread and quilt batting, but comes with a red envelope. It measures 8x8 inches. The holidays are never complete without ugly Christmas sweaters. Cthulhu, you can't escape this one! I found quite a few designs and colors for these sweaters! Here are some of my favorites! 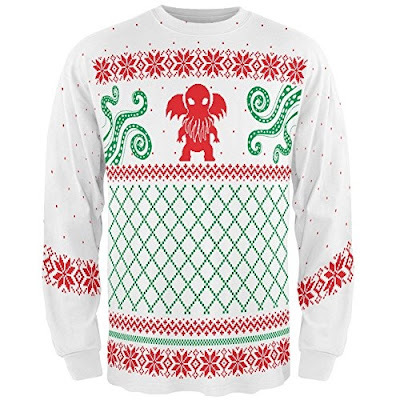 This Red, Green, and White Cthulhu Christmas sweater is probably my favorite one. 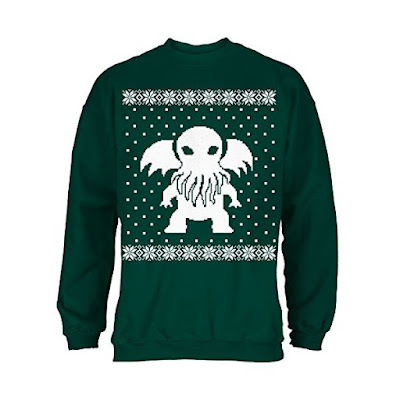 The Black Cthulhu Sweater and the Green Cthulhu Sweater are pretty hilarious as well. They all come in Small to XXL in size! If you want to win your Christmas party ugly sweater contest, I really do recommend this one. You will also have the blessing of the Great Dark Lord Cthulhu! Guarantee win, right there. 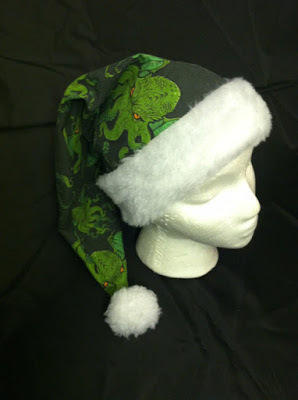 Your Cthulhu Christmas is not complete without this tentacle Santa hat. Last, but not least in my Christmas Cthulhu hunt, is this ridiculous mug! 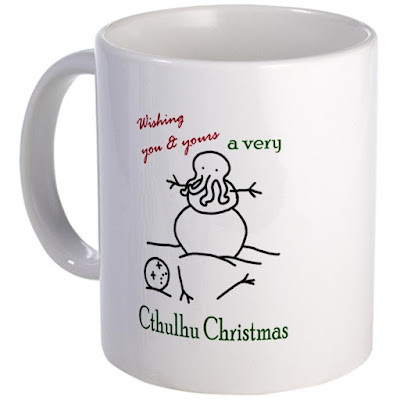 I couldn't help but laugh hysterically at this CafePress Cthulhu Christmas Mug. 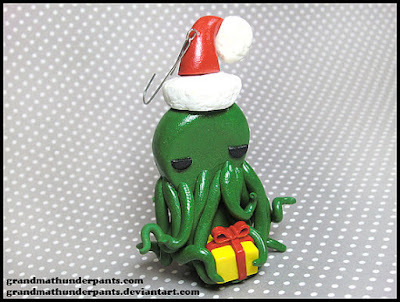 I too am wishing you and yours a very Cthulhu Christmas!